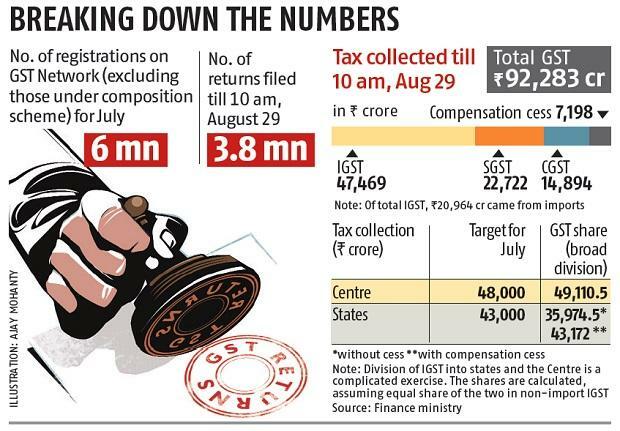 The collections under the goods and services tax (GST) in July, the first month of its roll-out, exceeded the Union and state governments’ target, even though 36 per cent of the assessees did not file returns. The governments have earned Rs 92,283 crore, against the target of Rs 91,000 crore. Extrapolating the targets in the annual Budget, the central government’s July tax revenue should have been Rs 48,000 crore. Assuming 14 per cent growth each in 2016-17 and 2017-18 over the 2015-16 revenues of the states, their tax kitty should have been more than Rs 43,000 crore for the month. The growth rate is taken in accordance with a formula of compensating loss-making states. Thus, the combined kitty comes to Rs 91,000 crore. With regard to GST collections impacting the fiscal deficit target, he said, “It is too early to comment”. Explaining the reason, he said now that the internal estimate had been breached in the first month of the GST roll-out, it meant that many businesses that were otherwise not paying taxes were coming into the net. “You will have to wait for a few more months to study the pattern… A more efficient taxation system checks evasion, brings in non-filers into the system; (now it is) more difficult to evade (taxes) — that seems to be the initial first reaction,” Jaitley said. Even if the compensation cess at Rs 7,198 crore was kept out, the target would be surpassed when all taxpayers filed GST returns, he said. It is here that experts said that caution should be exercised in interpreting the data. All assessees did not file returns because there were problems in TRAN forms required to claim tax credit on pre-GST stocks. When all these credits are taken, the numbers may look different. M S Mani of Deloitte said, “The aggregate figures of GST collection could not be compared to any other figures since it was difficult to project figures for state-level value-added tax, entertainment tax, etc. However, at an aggregate level, the GST would give taxes of Rs 11 lakh crore in a year,” adding, “Now, the Union Budget Estimates for 2017-18 project indirect tax collections of Rs 9.26 lakh crore, including those from non-GST taxes of basic customs, excise duty on petroleum, etc. Compared to that and state revenues, the first-month GST collections give an excellent sign, particularly when July is a flat month for businesses before the festival season begins”. Of the Rs 92,283 crore collected, Rs 7,198 crore has come from the cess, which will go to the states as compensation. Of the remaining amount, Rs 14,894 crore was the central GST (CGST), Rs 22,722 crore the state GST (SGST), and Rs 47,469 crore the integrated GST (IGST). In the IGST, Rs 20,964 crore has come from imports. So in the GST, the central kitty, before devolution to the states, would be broadly Rs 49,110.5 crore (Rs 14,894 crore, Rs 20,964 crore, and half of the remaining IGST, Rs 13,252.5 crore), with some changes later on. Experts, however, said that the division of the IGST was a complicated exercise. An official release said the division would be based on the cross-utilisation report to be received from the GST Network. The exact revenue figures of the central and the state governments will be known after this exercise is completed before the end of this month, according to the release. The states, on the other hand, received Rs 35,974.5 crore. However, if Rs 7,198 crore of the compensation cess, which will go to the loss-making states, is added, the states’ kitty will increase to Rs 43,172 crore, marginally higher than the target. Jaitley said that this revenue had come from 64.42 per cent of those registered under the GST in July, hinting at the possibility of this increasing when all started filing returns. There were 6 million registrations under the GST in July, excluding those under the composition scheme. Of those, 3.8 million filed returns by 10 am on Tuesday. The deadline for filing taxes ended on August 25, while those who wanted to claim credit on pre-GST stocks had the option of filing returns by August 28. 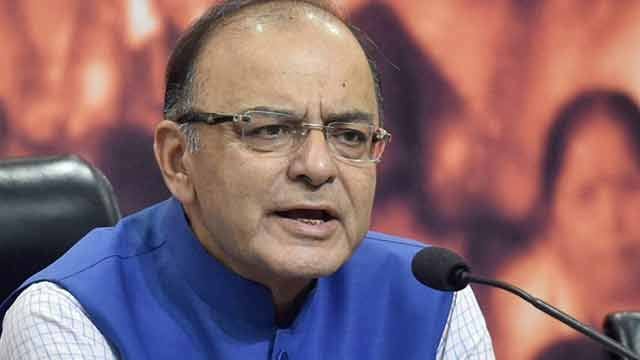 The figures given by Jaitley held good till the morning of August 29. This means that people are filing returns by paying a late fee of Rs 100 a day for the CGST and SGST each. They can also file taxes by paying interest at 18 per cent a year. Those who want to claim credit for input taxes on stocks with them till June 30 have to file either the TRAN-1 or TRAN-2 form, depending on whether they have receipts or not. These forms, experts say, are complicated and leading to delays in return filing. Archit Gupta, chief executive officer, ClearTax, said businesses are being cautious in filing TRAN-1 since it cannot be revised once submitted. TRAN -1 is a very detailed form, which requires businesses to report input tax credit (ITC) in old returns, and unclaimed ITC on capital goods, and also report and claim ITC on stocks lying with them on June 30. In the case of TRAN-2, if ITC is claimed by a trader, such benefit must be passed on to the consumer in the form of reduced prices. This had confused a lot of small businesses as to what they should do about input credit on their stocks, he said. Till 10 in the morning on Tuesday, 7.2 million taxpayers provisionally or completely migrated to the GST system. Of these, 5.9 million taxpayers have migrated to the GSTN and 1.4 million are yet to complete the formalities. Besides, 1.9 million new taxpayers have registered with the GSTN to date.